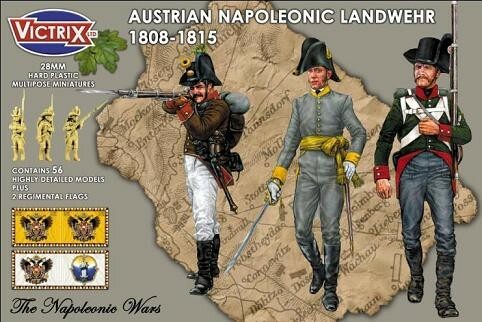 The Austrian Landwehr came into being in 1808 and were present in large numbers during the Wagram campaign. They were the distinctive Corsican style hat. Looking a bit like a top hat crossed with an Australian bush hat! The Landwehr wore many varied colour schemes and will add a nice uniform change to your armies if you want to break up the white ranks a bit. The Hat decorations were many and varied from regiment to regiment. We could not cater for all hat decoration styles. However we will include uniform guides to enable to you alter the hat decorations simply by cutting bits off or cutting off pompoms and gluing elsewhere on the hats. We have included 2 types of backpack in the sets. The first type has a bayonet attached. The second type has a bayonet and sword. This is due to the fact Grenadiers and some Landwehr carried swords and bayonets, whilst the ordinary infantry simply carried a bayonet. The backpack has the water-bottle, bayonet and cartridge box attached. This enables a greater level of detail on these items and prevents undercut issues. They are very easy to glue on with no tiny parts. And finally in each set there will be 2 flags. The regimental flag and colonels flag. There will be the 1792, 1804 and 1806 patterns. The earlier 1792 pattern was used by some units up to 1815. We will also be producing some extra flag sheets sold separately.